When a great player’s hype is dependent on masochists who regularly subject themselves to Ohio Valley Conference basketball, it’s not often that they actually shine on the national stage that March Madness provides. But Ja Morant showed up against fifth-seeded Marquette ready to make a splash with viewers across the country. With the first triple-double in the men’s NCAA Tournament since Draymond Green did it with Michigan State in 2012, Morant turned a predictable 5-12 upset into one of those games that will only be referred to with his name. Morant started this game as it seems all great guards seem to do nowadays: casually pulling up from an obnoxious distance and swishing the three. But Morant’s first half had hardly anything to do with his scoring. Marquette eventually stacked whichever side of the court he was on with players ready to make his life a living hell if he attempted any kind of shot. The plan worked for the Golden Eagles in the sense that Morant had only two field goals in the game’s first 20 minutes—more on the second one later—but in dedicating more players to the opposing superstar, they always seemed to leave at least one of Morant’s teammates open. It was almost as if they forgot the man they were double-teaming led the nation in assists this past season. It was a formulaic approach that gave Morant five assists within just five minutes of game time (he’d end the first half with eight), and Marquette just never adjusted. Time and time again he’d go down the court, drive to the basket, draw or freeze anywhere from two to five defenders, and use his incredible court vision to get the ball to someone who was wide open behind the arc. Of course it certainly helped that he had teammates capable of knocking down threes when called upon, like Tevin Brown, who had three of his three-pointers assisted via Morant’s alert passing. But it wasn’t as though these passes were any sort of concession. Morant said after the game that he lives for getting his teammates in positions to score, meaning that Marquette had basically forced him to do his favorite thing on the court. Even as scoring seemed to almost become an issue for Morant, his confidence never wavered. That much became clear in the final seconds of the first half. The Golden Eagles appeared to finally have learned their lesson and didn’t immediately bring defenders to double-team Morant. After sizing up the guy guarding him, Morant took a couple dribbles, went with the step-back and hit a James Harden-like three. That first half was as difficult as it got for Murray State. Marquette chose to just lay down and die in the second half, and Morant and company did whatever they want for those last 20 minutes. Morant was able to find his way to the basket more easily than ever before, which led to his loudest dunk of the night. 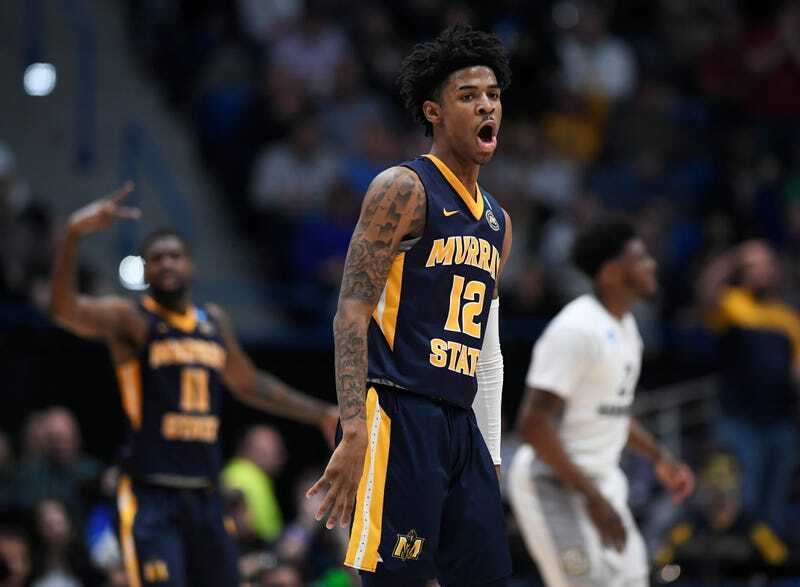 Best of all, as the Racers’ lead grew further and further out of their opponent’s reach, it allowed Morant to cement himself among some of the best tournament performances in college basketball history. He picked up seven of his 11 rebounds in the second half which allowed him to become one of the few players in men’s college basketball history to get a triple-double in a tournament game. That list includes players like Dwyane Wade, Shaquille O’Neal, Magic Johnson, Draymond Green twice and Oscar Robertson four times. Beyond the stats, Murray State also seems to have been able to work cohesively with its future top-3 NBA Draft pick. As SB Nation’s Ricky O’Donnell pointed out, the Racers only let opponents shoot a 46.4 effective field goal percentage this season (20th-best in the country) and 28.5 three-point percentage (fourth-best). That kind of defensive stoutness particularly comes in handy when you’ve got a point guard whose pass-happy style can occasionally lead to a few too many turnovers—Morant ended today’s game with seven. The question now becomes how far this mid-major darling can go in the tournament. Today’s display showed that good coaching has allowed this team to do the little things well—their ability to switch on defense against Marquette was poetry in motion—while complementing its superstar. But it also showed that the Racers are an athletic, physically-imposing team that flat-out kicked the Golden Eagles’ teeth in. This bodes well for their upcoming match up against Florida State on Sunday. Despite what the scoreboard might imply, the Seminoles really did sneak by a sharpshooting Vermont squad earlier today thanks to their own physicality. Teams that need that extra push often are unable to sustain much success in tournament settings because they have nowhere to hide when exhaustion hits. It’ll be at that moment that a team like the Racers will be in prime position to steal a win. Then, the goals can get loftier.